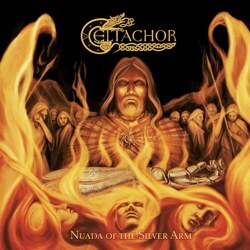 Celtic folk black metal band Celtachor from Dublin, Ireland will release its second full-length album “Nuada of the Silver Arm” on April 24th, 2015 via the German label Trollzorn / SMP Records. Born in 2007, Celtachor became a full working band in 2010, melding the influences of black, doom and folk metal together in one combined force. The band sees themselves as the narrators of Irish Mythology with main goal to showcase their own vision of those stories, playing the music with passion and from the heart. Celtachor self-released their debut album “Nine Waves from the Shore” in November 2012 and they have shared the stage with the likes of Skyforger, Primordial, Heidevolk, Suidakra, Cruachan, Wolfchant, Alestorm, Mael Mordha, Waylander, Thurisaz, Nothgard, Darkest Era and Belenos. Cover artwork and album tracklist are already unveiled!